One of our readers discovered yesterday that through a loophole in the Android Market and browser, you could install Google Wallet. After the community got a hold of this method, they quickly realized that this not only works for Wallet, but just about any app that a carrier has blocked from your phone. 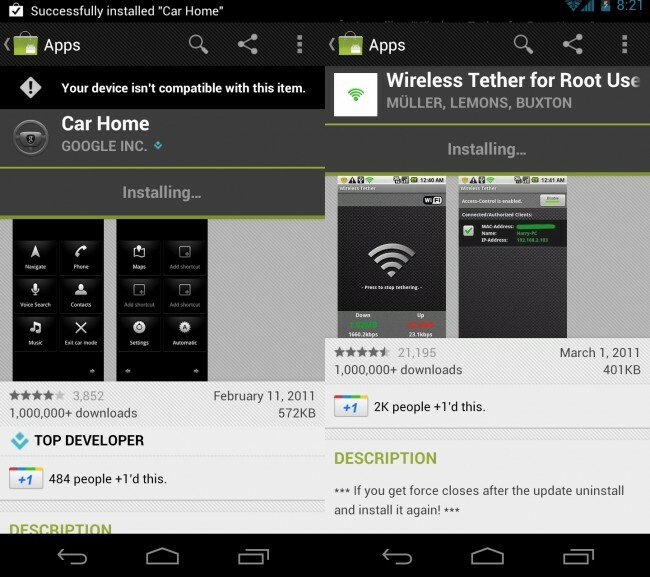 As you can see in the screenshot above, I was able to download and install both Google’s Car Home app and Wireless Tether. There is a good chance that this will be patched before too long, so for now, feel free to load up just about any app that you would like. For the most part, this will get you into just about any tethering app you want, but there are bound to be other hidden options. In the comments, feel free to drop as many that you can think of to help out the rest of the community. *Tip: You may want to clear data and defaults on browser and Market before doing this. 1. From your phone open the browser and head to http://market.android.com. *If your browser prompts you to open the Market, don’t. Just stay in the browser. 3. When the results come back, tap on the Google Wallet icon. 4. Tap the “Install” button from within the browser and then sign into your Google account. *Again, this is all from the browser, not the Market app. 5. Once you have signed in, you should be redirected back to the Market page in the browser. 6. Obviously, you will not have the option to install there since the VZW Nexus is not supported. 7. Tap the back button until you are prompted for the Market or Browser again, this time choosing the Market. 8. The Android Market should open to the Google Wallet page with an option to install.